As I was idly strolling around in Chelsea last night, waiting for a phone call and trying to avoid my stifling apartment, I decided to pop into the American Apparel that I often forget is kitty corner from my building. While Vampire Weekend's "Diplomat's Son" played, I picked through the weirdly cut bodysuits and Legalize Gay shirts, and checked out the new colors of my favorite carry all pouch. Suddenly my eyes widened as I spied a mass of navy and white stripes on the other side of the fixture. It was the carry all weekend bag I posted about here, but in bold stripes that immediately called to me. "Taylor, pack me full of shorts and bikinis and sunglasses and take me to the beach for a weekend! Please! I will look so good, and I have room for everything! I promise!" It seemed to say. I picked the bag up, unzipped it and peered inside. It's absolutely cavernous. There aren't any inside pockets or snazzy features, it just looks cool and hold a lot. 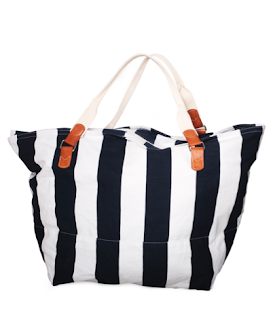 It's a weekender that doubles as a beach bag which, at this time of year, is pretty much ideal. I would imagine you can also just throw that bad boy in the wash (or get it dry cleaned) when it starts to get a little dirty, which makes the $72 price point even more appealing. I told you guys a while ago that I was feeling like the East Coast was taking over my summer style... I suppose this is just one more step towards revisiting that fuchsia Lacoste polo dress I bought circa 2002. Check out the bag online, and note that it also comes in navy and red stripes, or in a few solid hues for about $15 less. Additionally, I'm pretty obsessed with this.